Alphonse Island lies in the heart of the Indian Ocean, 7 degrees south of the Equator and 500km south-west of the capital island Mahe. It is part of the Alphonse group extending 16km from north to south, comprising three islands: Alphonse in the north, Bijoutier in the middle and St François in the south. Now perhaps more famous for its fishing, Alphonse Island is a small triangular-shaped coral island strewn with coconut trees, boasting 3.6km of coastline protected by a reef, and offering the most idyllic setting for a very exclusive holiday. 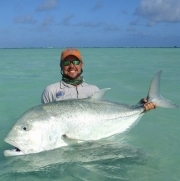 Please click here for link to Fieldsports article on Alphonse Island fishing. St. François is uninhabited and the lagoon is approximately seven miles long and four miles wide. The lagoon has a firm white-sand bottom and is interlaced with channels and cuts. The number of people allowed to fish there is limited to 12. The uniqueness that sets St. François apart from many other destinations is the ability to wade over 10,000 acres of hard, white-sand flats in search of bonefish. Even the novice saltwater fly fisher can spot and cast to fish with relative ease. Very few of the flats are heavily grassed, although these areas can prove to be productive for larger bonefish. Bonefishing is best done when the tide is on the move and is least productive on the low tide. A typical session will involve wading from the skiff for a few hours, either fishing to cruising or tailing fish. This will last for as long as the fish remain on the flats. On the dropping tide, huge shoals of bonefish can be targeted leaving the flats in what has been described as a continuous river of bones. It is an extremely diverse fly fishery that caters for all skill levels and tastes. It is paradise for first time saltwater fly fishers, as good sized bonefish patrol the vast area of white flats in huge numbers. For the more experienced angler, fishing for large bonefish in the shallow waters surrounding the uninhabited shores of St. François is incomparable. Indian Ocean permit are more and more common and offer all the challenges of their Atlantic cousins. Powerful triggerfish crunch crab patterns on the reef and flat edges. It may come as no surprise that more than 60 species of fish have been landed here on fly. There are two bluewater boats available for charter. One is primarily for fly fishing and the other for conventional angling. There are big drop offs and deep water close to Alphonse and offshore species that can be caught include sailfish, dog-tooth tuna, yellow-fin tuna and wahoo. The bonefishing at St. François is as diverse as the fishery itself and will cater to all levels of anglers. Whether you are after tailing singles or mudding shoals, the guides have the ability to make it happen. 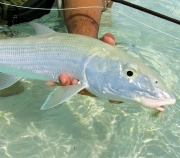 St. François is reputed to have the densest population of bonefish recorded world-wide. St. Francois has seven species of trevally. The three most common are the brassy, bluefin and giant trevally. The brassy trevally grows to around 12lbs but gives an excellent account of itself on a 10-weight rod. It is slightly longer than the usual trevally shape which gives it tremendous stamina. The bluefin trevally attains 18lbs and when caught in the surf can be a real handful. The giant trevally, or GT, is the real king, reaching weights of 150lbs. The biggest GT landed on St. François was estimated at 115lbs. 20 to 40lbs fish are more likely and can be found cruising the flats in search of mullet and bonefish or on the edge of the reef. At certain times of the year, milkfish feed on plankton near the surface and are then enticed to eat flies. They are incredibly strong fighters and the use of a skiff is necessary to land them. It is imperative to listen to your guide whilst fishing for these phenomenally strong fish as the guides have the experience of landing and fighting these fish. Over 60 species have been landed here so you never quite know what might turn up. Triggerfish, pompano and barracuda are among some of the other regulars. The fishing is based from Alphonse Island Resort. This is a first-class resort, which has 15 comfortable A-frame chalets. The thatched chalets are on the beach front with views out to sea and are in a classically tropical setting surrounded by palm trees. The rooms have ensuite bathrooms with a sunken bath and open-air showers. Each chalet offers single, double or twin accommodation and is air-conditioned with a selection of towels, bathrobes and beauty products. There is the option to upgrade to one of the four villas. These are much more spacious rooms with a seating area and plenty of hanging space. Outside they have their own private jacuzzi and table and chairs. 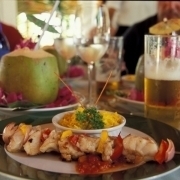 Non fishing activities include eco walks, snorkelling in the Alphonse lagoon and sunset cruises. There is also a floodlit tennis court with racquets and balls available. To keep in touch with the outside world, chalets also have satellite television and a direct-access international telephone. Wi-fi is avaailable in the bar area. Guests can enjoy drinks and dinner at the beach bar and restaurant or if they prefer at one of the intimate tables set into the sand nearby. Alphonse offers the absolute best fishing for a variety of species and single rooms as standard. Land packages for (Oct 2016-May 2017) are from $8,500 for a 7-night stay. Non fisher sharing with fisher from $4,900. Charter flight $700. For further information on Alphonse Island Fishing please see the latest brochure here. Guests will be asked to sign a Guest Indemnity Form on arrival on Alphonse Island. Click here to view a copy.